Please feel free to contact us for advice or quotations. We supply a variety of Roller shutter doors - Roller shutters are closures where the door leaf rolls up above the doorway. The main advantage when using a roller shutter door is the very small space required for installation along with the fact that the door is relatively easy to install and does not require any complex installation constructions. Roller shutter doors are easy to operate due to the built-in counter balancing mechanism in every door. They also provide a security closure of considerable strength. Roller shutters are economical to install and maintain, are durable and reliable. A roller shutter door is versatile in that it can satisfy security needs while also offering visibility and / or ventilation if required. 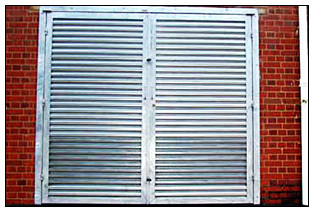 The construction of roller shutter doors allows the shutter to roll up or down from a revolving shaft barrel mounted onto steel support brackets. A bottom rail strengthens the shutter and allows for the fitment of handles and locking devices. The shutter is prevented from moving sideways by channel guides and endlocks.